Guitarists have always had a love-hate relationship with solid-state amplifiers. On one hand they can hardly hold a candle to their tube powered counterparts in terms of sound quality, but on the other hand they do tend to be more reliable and usually cheaper. And although the purists might argue against them, there is much to be said about a quality solid-state amp that provides great tone at a great price. The Fender Frontman 212R is such an amp. The thing about Fender’s design ethos is that although it is age-old, it’s timeless. 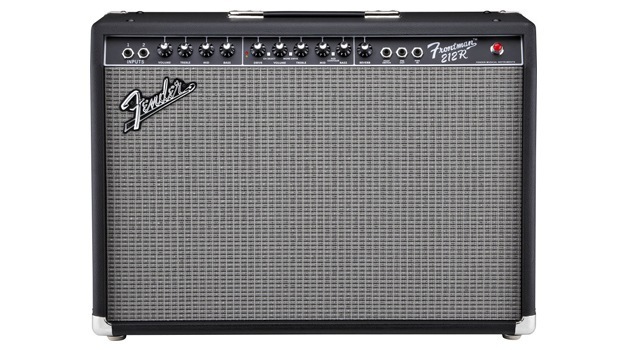 And the Fender Frontman 212R looks the part of a classic Fender amp. The 212R’s outer casing sports a black textured vinyl covering, silver grill cloth, chrome hardware and Fender’s iconic Blackface control panel. The build quality is as high as you would expect from any Fender amp, and the 212R feels like it could take a beating on the road or in the studio. The only downside as far as the amp’s build goes is that at 48lbs, it’s more than a handful to lug around. Fender could have helped out the touring guitarist a bit more by including casters or side grooves to make transporting the amp a little easier, because given the amp’s weight the top handle is more of a cosmetic addition than a practical one. The 212R’s interface is deceptively simple; which is a good thing. The front panel includes two ¼” inputs for the amp’s clean and drive channels, as well as dedicated EQ control knobs for each. The 212R also carries a dedicated reverb control and switches that control channel selection and the amp’s “more drive” feature. As far as controllability goes, the 212R comes with a Fender footswitch and also includes an effects loop with pre-amp out and power-amp in. The first thing that you need to know about the 212R is that it is freaking loud! The amp’s two 12” special design 50 watt speakers sound absolutely massive and help the amp project through in most live band situations. However, the sound quality of the 212R can be a little poor on lower volume settings, so if you plan on using your amp mostly for indoor and practice purposes, this might not be the best option for you. Like most Fender amplifiers, the tone on the clean channel is beautiful and crisp, and can be tweaked with the EQ settings depending on the type of guitar that you’re using. The tone on the drive channel is nice and crunchy and is excellent for blues and classic rock playing. That said, once you crank up the drive past 6 or 7 and engage the more drive feature, the sound can get a bit muddy so it’s not really likely to sit well with guitarists that play hard rock and metal. However, combined with a good effects processor or pedal board, the amp can really pack a punch. Another noticeable weakness in the 212R is in its reverb, which can sometimes sound a bit flaccid and weak. The Fender Frontman 212R retails around the $300 mark, and considering its excellent tone quality you’d be hard pressed to find a better sounding amp in the same price range.